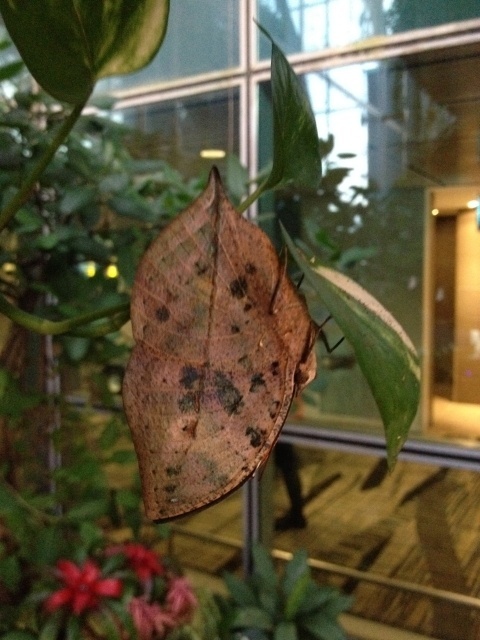 The Changi Airport is known for being the best in the world, and here’s why! 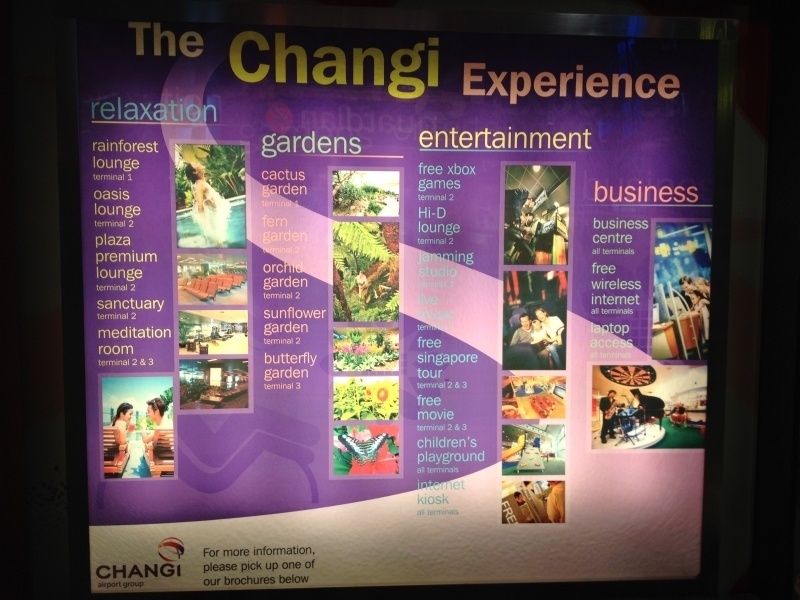 As you can see from this informational sign, the Changi Airport offers many, many things to do. This sign is in Terminal 2 and lists only the things to do once you’ve gone through security or are in transit. It doesn’t even list the activities to do once you are outside of security. Singaporeans make a day of going to the airport. There’s fun for the kids, great food, and great shopping, but we want to do the stuff inside, so here goes! 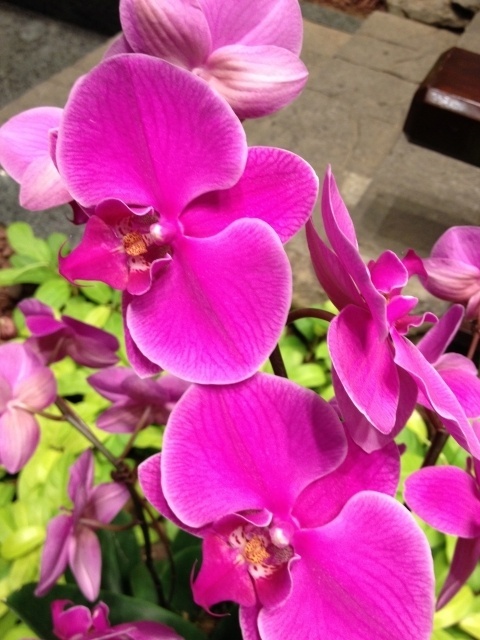 There are a number of gardens from orchids, to sunflowers, there are flowers everywhere. We were at the airport a couple of times at different times of the day, and each time we saw gardeners clipping, cleaning, watering, and making sure everything is beautiful. 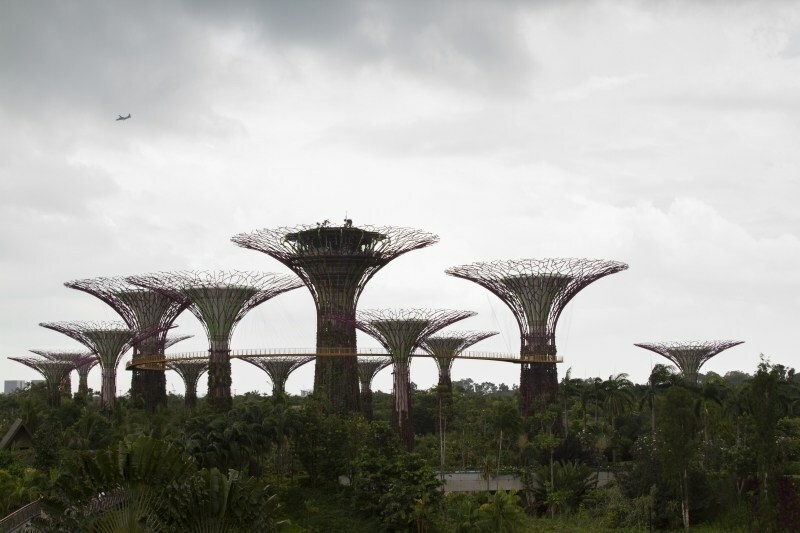 The gardens are sculpted with water features, art installations, and informative signs. It is not only relaxing and pleasing to the eye, it’s educational. Reading up before we arrived, we’d heard lots about the butterfly garden in Changi, so that was high on our list to see. Unfortunately, we got there as the sun was setting and the butterflies were settling in for the night, but we still saw quite a bit. In such a small area, there was a staircase and observation platform to get up high, a vertical case containing collected chrysalis’, two feeding trays to attract the butterflies and make them very easy to see, and lots of plants and sunlight streaming in to keep them happy. We couldn’t believe how many people were there. Mothers with children, old men, backpackers. 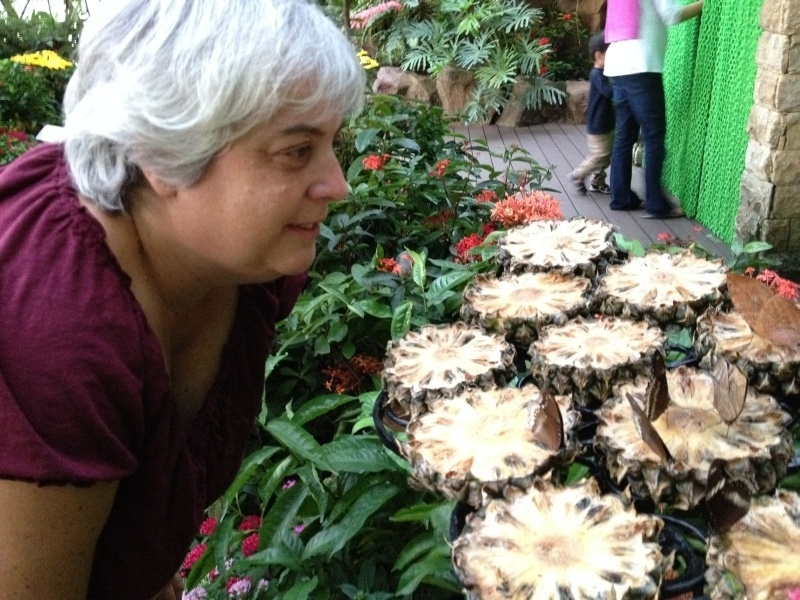 Everyone wanted to see the butterflies. As we stood there a caretaker came and struck up a conversation with us. He told us he had been there to help build the enclosure and it was his job to take care of the butterflies and talk to the people about them. What a cool job! One of the coolest sections of the airport was a media haven! 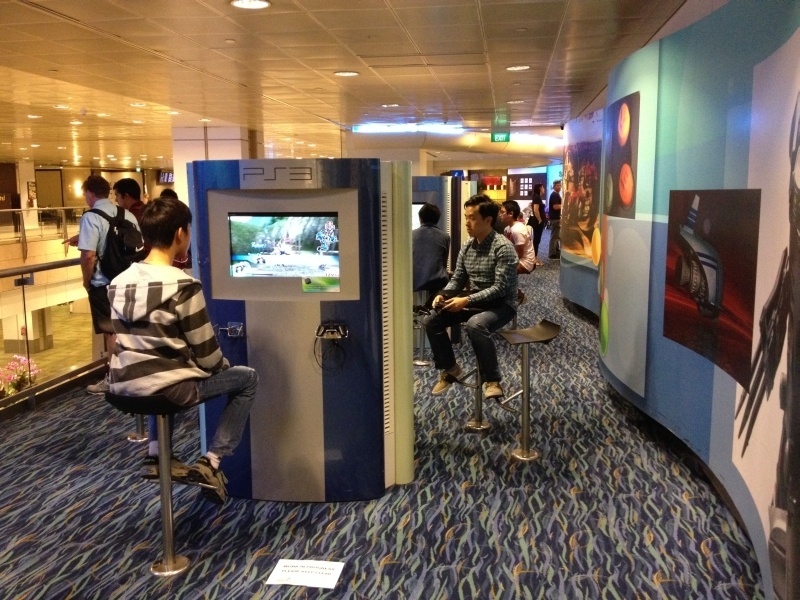 There were booths and kiosks for playing video games, either individually or with others. We saw backpackers and families all crowded into one booth playing together; what a great way to meet some new folks! In this same area, there was a theater with a free movie schedule, music booths where you could go in, play or even compose music. 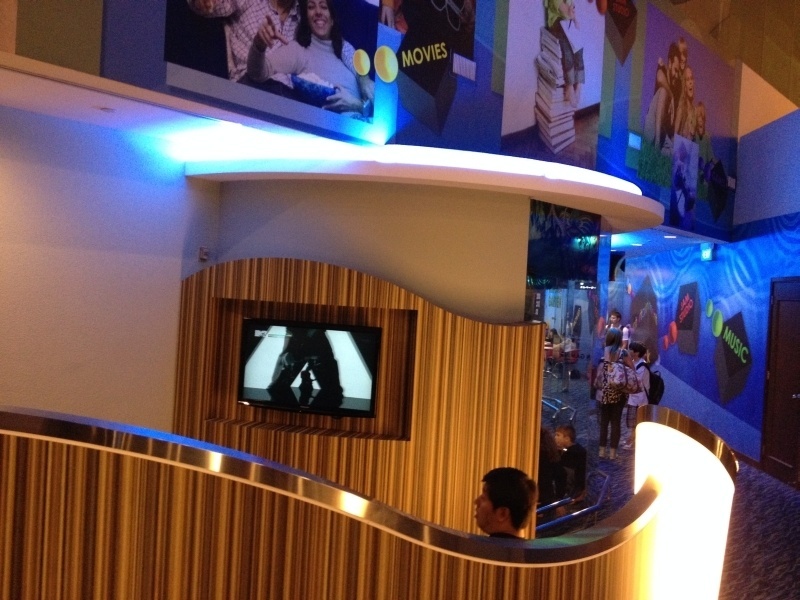 There were also smaller TV areas where you could pick your own movie to watch with your travelmates or family. There were plenty of computer terminals for surfing the Internet, and of course reading blogs! Needless to say this area was packed with kids of all ages. There was a small cafe right there so you could get your drinks or snacks and just relax. I could tell the moms were thrilled to have something to keep their children occupied and happy while waiting for their flights! 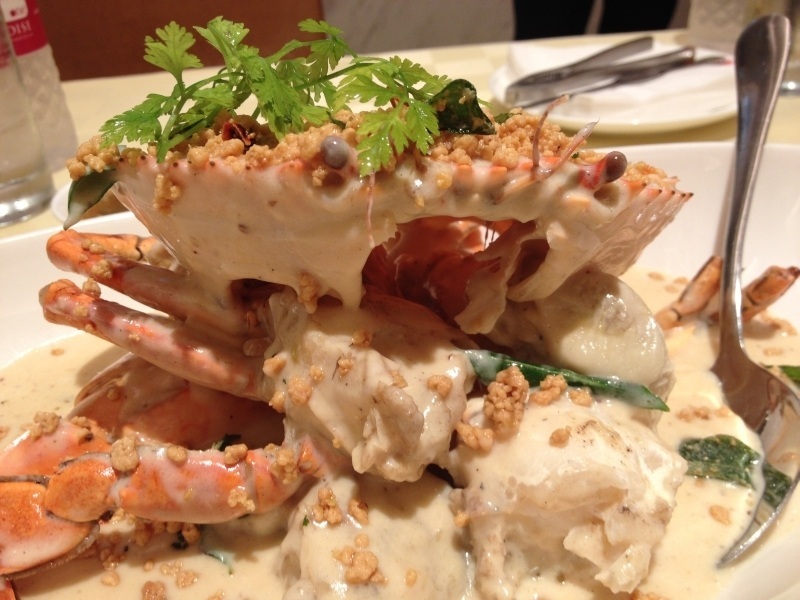 Changi has so much to offer, there just really isn’t enough time to try it all! We checked at the hotel and spa to find that there were no rooms or spa appointments. You have to book ahead. We did have our swimsuits with us and would have loved to take a dip in the pool, but we spent way too much time exploring. Next time, though, I’m definitely going swimming. Have you been to the Changi Airport? What did you do while you waited? Tell us all about it in the comment section! This post and others are a participant in the fun Monday Photos Post at TravelPhotoDiscovery….go take a look and join in the fun! Mike, We love Singapore. There’s a few more posts on the city coming down the pike. As an Asian city, it’s one of my faves! I was just about to say that Singapore airport was one of the worst we have ever stayed at. There were no free electric sockets available there and we could not lie down on the floor. Everything was expensive as well!! Agness, That’s funny. There definitely was an entire area for people with their own laptops, plus we saw people plugged in a few other places. I wish I’d taken a photo, but it’s so true that everyone always has different experiences don’t you think? Wow, that is fantastic, I’m impressed with all the combinations of activities that’s available and free! Excellent tips! Noel, It was pretty amazing. We were a little bummed we didn’t have more time to try everything out. We packed in as much as we could. If we have another layover, I would definitely take the free tour to see what that is all about! We love Singapore Airport, but I do agree with Agness that it is expensive. I did see areas for people with their own computers. Having lost our computer we did not put them to the test. The thing I really liked about it was that for $8 you could get a shower – and you could share it with a friend (my husband of course!). They provided the towels, soaps etc. Jan, I agree. As Asian cities and airports go, it’s one of the more expensive…but I didn’t mind at all, because there were also a lot of freebies. Changi airport is just the best. I haven’t been for a while now (8 ish years) so it’s probably even better than it was but there was a time I was a regular passer-through-er and really appreciated all it had to offer. I remember appreciating being able to go outside and breath some real air even if it was 30°c and nigh on 100% humidity, at least it wasn’t recycled airconditioning. Phoebe, I know the sunflower garden was outside. I think it’s put together really thoughtfully. Changi Airport is my family’s favorite for a long layover. In fact, the last time we transited through there, my daughter was disappointed we’d only be there long enough to grab a quick snack before boarding the next flight. 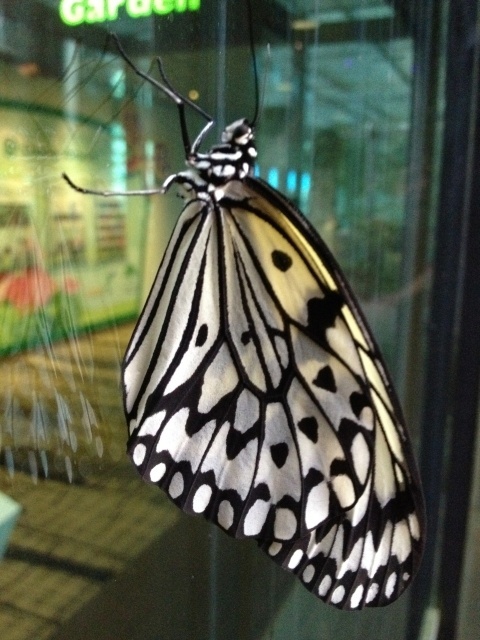 The only times we’ve been in the Butterfly Garden has been late at night, so there was not much to see. On the other hand, they had these 20 foot tall topiary structures of the Colosseum, the Leaning Tower of Pisa, and a Trojan Horse. Michele, Yes! I saw the Kremlin. It was pretty cool. I think they are always doing something. It’s a great airport. I just love it. Yes Sophie, Changi has lots of things to keep folks of all ages busy, for many hours!